They are saying that a large chunk of the sun is gone in the following Video from America News Room. Does it has anything to do with Nibiru, is Nibiru by any chance crossing over our sun? http://www.youtube.com/watch?v=gEPuzX2ix3k [and from another] http://www.kpopstarz.com/articles/36181/20130730/coronal-hole-sun-2013-nasa-star.htm A NASA space telescope has spotted a giant coronal hole in the sun. The dark spot covers almost a quarter of Earth's closest star, and is shooting solar material and gas into space. The hole in the solar atmosphere is over the sun's north pole. The dark spot came into view between July 13 and 18 and was observed by the Solar and Heliospheric Observatory, or SOHO. Coronal holes are darker, cooler regions of the sun's atmosphere, or corona, containing little solar material. [and from another] http://news.discovery.com/space/astronomy/theres-a-hole-in-the-sun-130603.htm It’s the largest coronal hole to be observed in the sun’s atmosphere for over a year. [and from another] http://helios.gsfc.nasa.gov/chole.html January 11, 2011: Holes in the sun's corona – NASA, August 28, 2010: Hole in the sun – APOD, September 27, 2007: Hole in the Sun – APOD, March 18, 2003: Coronal holes on the Sun -- NASA GSFC APOD, February 7, 2002: Coronal hole -- NASA GSFC APOD [and from another] http://sohowww.nascom.nasa.gov/explore/lessons/compos9_12.html The solar wind consists of charged particles, mainly protons and electrons, emanating from the Sun in all directions. Coronal holes are noted by man as regions where x-rays and ultraviolet light are either absent or low. Man has observed that the solar wind seems to blow from these “holes”, and speculates that coronal holes also spew magnetic particles into space, lacking a loop-back into the Sun. Man does not understand the processes within the Sun, and almost all of his speculations are incorrect because he is unaware of over 99% of the particle types that exist. He sees the boiling on the surface, mass ejections or sunspots, and makes assumptions. What can be assumed from the observations that x-rays and ultraviolet light are not emitted from coronal holes, but the solar wind is, and the solar wind is composed of highly charged material, a positive electron outflow? X-rays are easily blocked, so their absence in coronal holes is not surprising. Photons, light, is also easily bent by gravity or blocked by almost any substance, so its absence is not surprising. Electrons and magnetons often flow together, the electro-magnetic relationship, so that some magnetons are bursting forth along with a positive electron flow is also not surprising. So what is causing the coronal holes that x-rays and light are blocked and an electromagnetic flow is escaping? When the dense material inside the core of the Sun moves toward the surface, it brings its electromagnetic flow with it, and with little to block this flow, it escapes. Has Planet X influenced the size or incidence of coronal holes in the past decade, since it arrived in 2003? 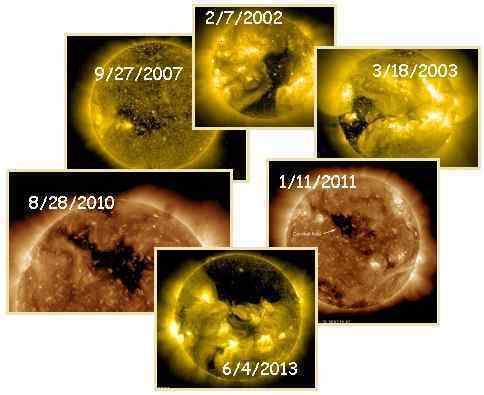 Coronal holes existed before it arrived, and are part of the normal solar cycles. We stated during the period of low sunspot activity in 2008 that when Planet X points its S Pole toward the Sun, it can have a quieting effect on the Sun’s surface by pulling magnetons into its S Pole, the intake. Likewise when Planet X pointed its N Pole toward the Sun, as during 2003, it ruffled the Sun’s surface. The large coronal hole observed in 2013 is equivalent in size, when total area is computed, to others during this past solar cycle such as the 2002 coronal hole. Planet X did not cause this, nor even influence this.